When you think of Lambton County's nineteenth century oil boom, do you think of exotic beaches, palm trees and sunshine? Probably not! 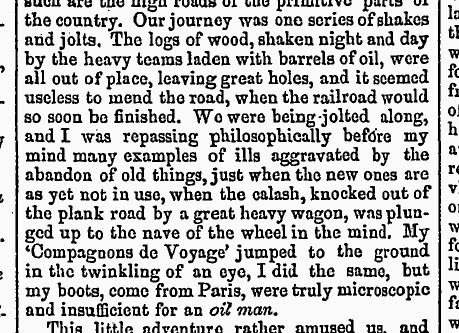 Would you be surprised to hear that at least one newspaper in sunny Mexico City was reporting on our local oil industry in the 1860s? The international appeal and impact of our local oil history is truly astounding! Reporter Felix Foucou wrote for The Two Republics, an English-language newspaper that was distributed in Mexico City. It was published between 1867 and 1900. Between October 1869 and January 1870 Foucou published a series of chapters exploring the international oil industry. He traveled to North American oil fields including Petrolia, and provides an overview of our local oil boom and a firsthand account of his visit here.